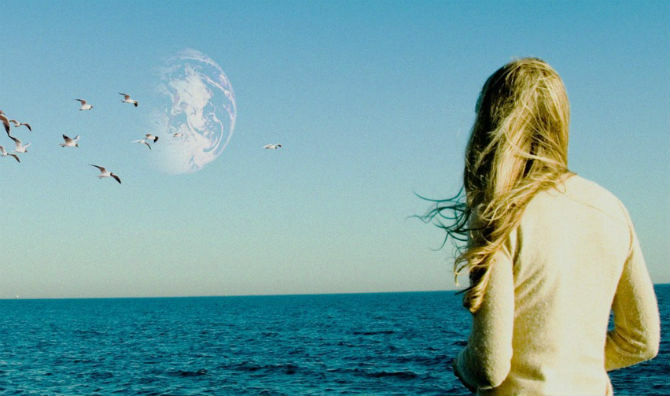 Another Earth is the new sci-fi independent film about the discovery of a mirror earth. The discovery just so happens to coincide with a deadly car crash involving MIT business student, Rhoda Williams (Brit Marling) and a family in a minivan. Rhoda is sent to prison for several years and upon her return there is an essay contest for a civilian to board the shuttle to the parallel earth. Rhoda has her mind set on winning this contest so she can see the life her alternate self has led. This film reminds me of another sci-fi indie, called Primer. Primer delved into the the real-world application of time travel. It was slow-moving, but absolutely ingenious. William Mapother costars as John Burroughs, the widower whose family died in the car crash. I suppose I'm confused about this part. As the widower (who was also in the crash), if someone killed his entire family wouldn't he be aware of who Rhoda was, that she went to prison, and that justice was served for his family? Would he be oblivious to the woman who killed his family? Ha, a parallel earth and that's the part that's unbelievable to me, right? It may be a tad too sentimental for me. Will anyone else be seeing this one? Another Earth releases next weekend, July 22, 2011 in limited release. It sounds interesting, but yet it also sounds like a Lifetime movie meets sci fi type of story. I think I'll wait until DVD or Netflix. Yes, agreed. The concept is interesting but the film itself looks overly sentimental. I will probably Netflix it. It reminds me of Melacholia with Kristin Dunst. Interesting concept. I wonder what my other me would be like. I wonder if the earth 2 looks at earth 1 and goes that earth 2. I also wonder if we can see this other earth and you get to fly to it why isn't anyone flying to see people on earth 1. Is my other me too good for me. I would def see it on netflix cause it would be interesting to see what happens in the end. This definitely seem awesome & I'd check it out. It's probably more drama over sci fi but still, I think it'll be cool. The plot is quite interesting though I agree that it may be too sentimental. PS: The trailer for Dream House isn't out yet. Let's hope they'll release it soon. @slowedeath - I'm definitely going to netflix this b/c I'm curious how they handle the concept that this planet just appears and we never noticed it before. I also wonder what the other me would be like. I hope she's a millionaire or something. @RealQueenofHorror – Yep, definitely more drama than scifi. I always find dramas that incorporate science fiction interesting, however, I wish we'd see more dramas that incorporate horror, like The Shining or The Thing. @Jaccstev – Yep, I agree. I don't do sappy so I'll wait for this on dvd so I can fast forward through the sap-filed scenes. I am curious about Dream House. The casting is great. Keep us updated. @Triper – You're welcome. What kind of films do you like? I saw this preview a little bit ago and wanted to see it, thanks for the reminder.